I hope you all had an amazing holiday weekend – I did, I only wish the weekend was longer! The extra day off did give me the opportunity to work on a few projects, one of which was transforming the most hideous beast of a bench into a true beauty. 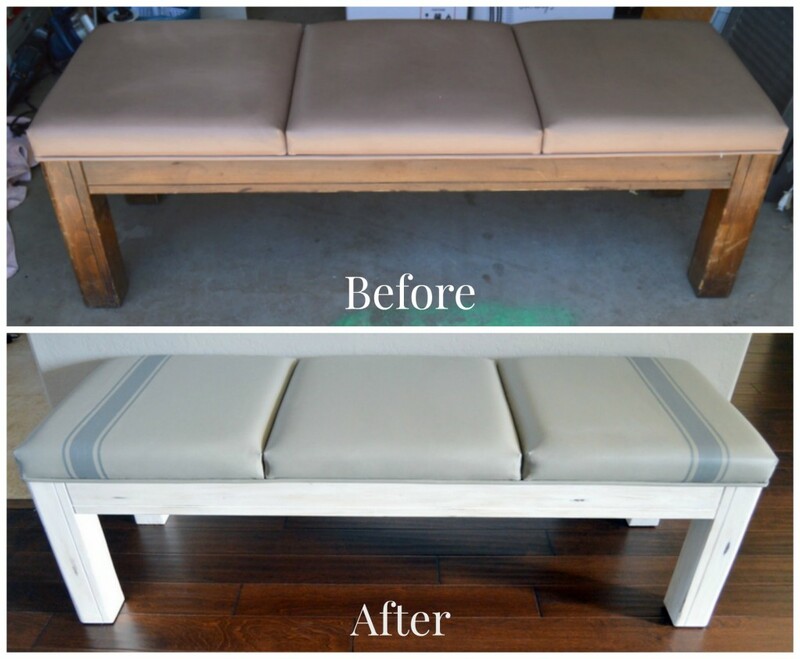 As you can see from the before pictures, it wasn’t much to look at, but it was in good shape structurally, and the vinyl cushion had no rips or tears – the perfect candidate for a makeover! It took me a few days to figure out exactly what I was going to do to it, but I finally decided on a French grain sack effect. It was a fairly straight-forward project. 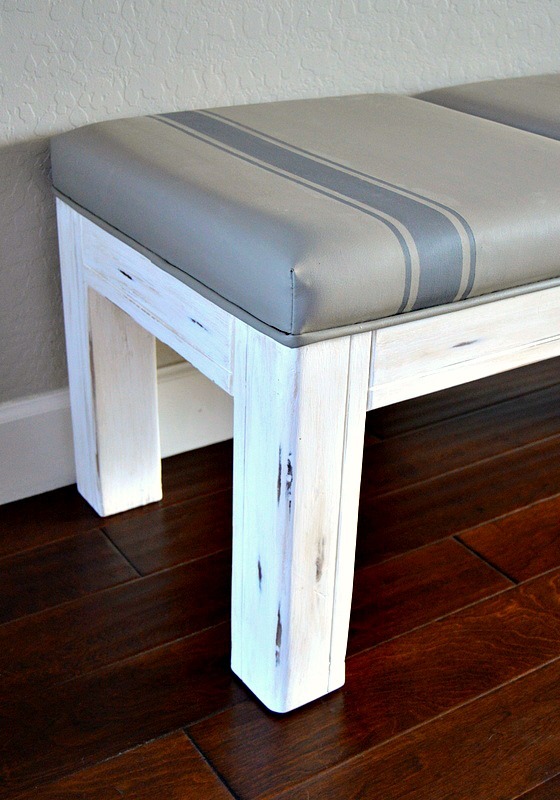 The wood parts were sanded down, then painted with chalk paint. A little distressing, then some antiquing glaze, and finally a coat of wax. 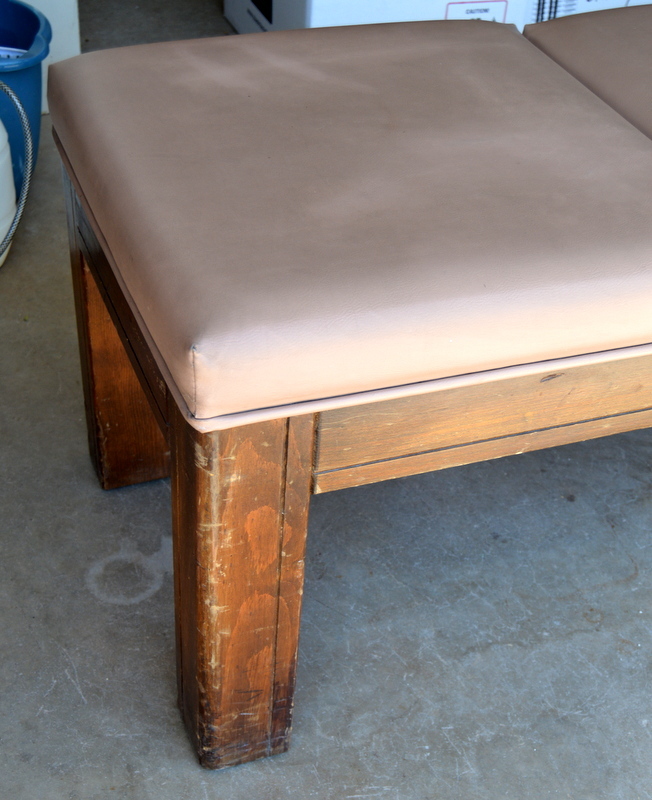 The cushion portion had me a bit stumped, but I knew re-upholstering it was not going to be an option. After doing a bit of research, I decided chalk paint was the way to go.I used a 50/50 (paint + water) mixture, and layered three coats, letting each coat dry thoroughly before painting the next. Once all coats of paint were dry, I used painters tape to tape off and paint the “grain sack” stripes, in a darker colored paint. The last step was applying a coat of wax to the seal the paint. 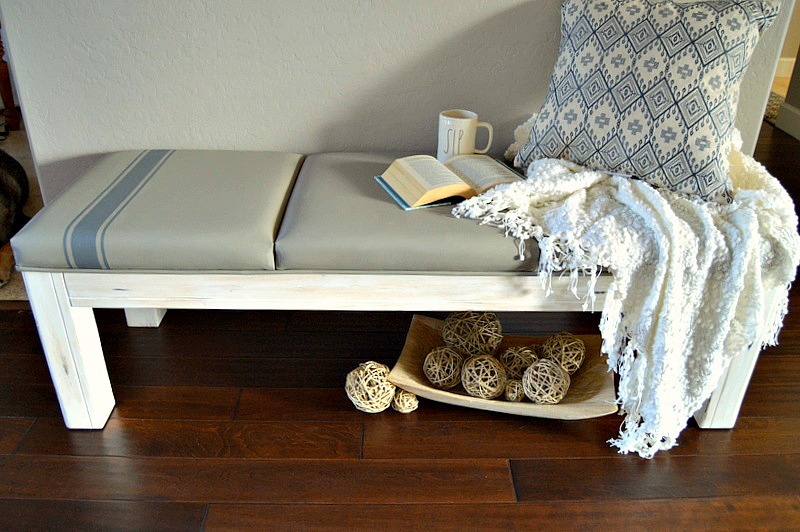 I was afraid the paint would make the cushion feel stiff, or the paint would crack, but honestly, it feels just like it did before I painted it – smooth and pliable. I think the key to getting such a great finish was layering the 50/50 mixture, instead of doing one or two thick coats at 100%. It was a bit of work, but the bench was free to me, so I figured it was worth the time/energy investment! 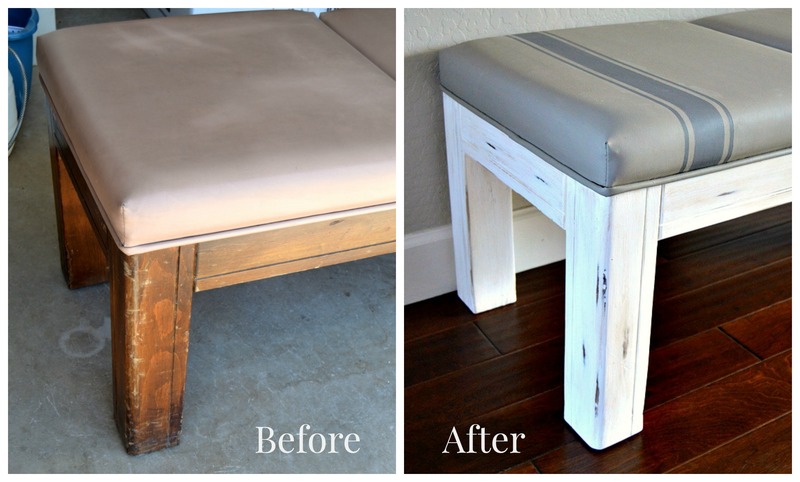 And here’s proof that vinyl can successfully be painted with chalk paint! I think it turned out great, Amy! You truly took it from trash to treasure! Thanks so much, Lynda! I was a bit unsure if it would actually work, but the bench was free, so I gave it a try! So glad I did! WHAT an original idea! I would have considered covering it in a fabric; but would never have though about painting it to give it a french grain sack look. It turned out great! Thank you Lora! 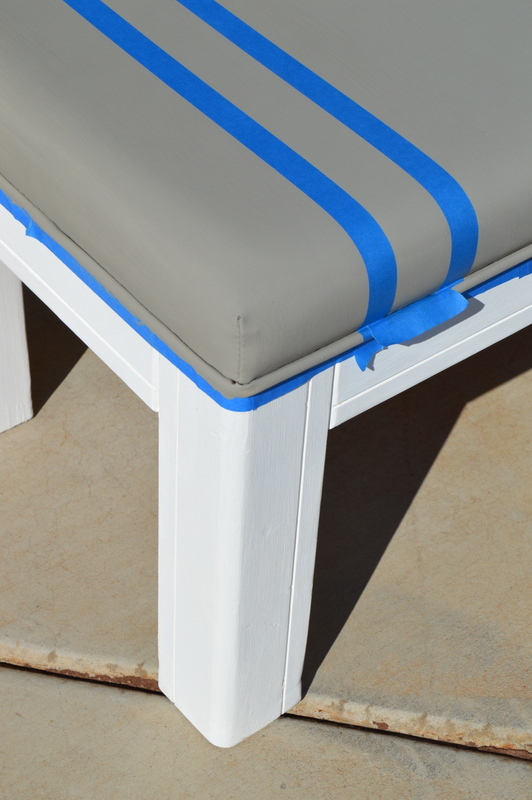 My upholstery skills are sorely lacking – but I’m pretty good with a paintbrush! Thanks so much for stopping by! I love that you painted this! 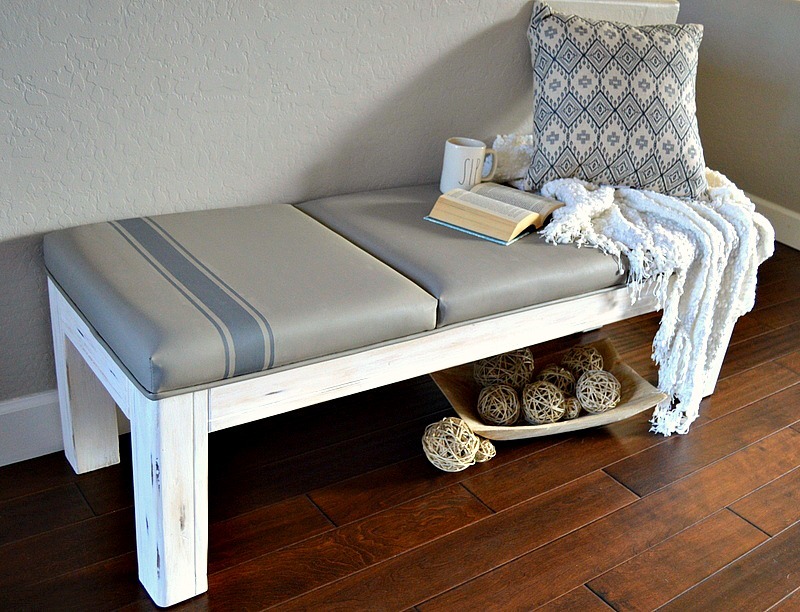 It looked so dated before but now looks like it is just the bench that belongs in your home. And the grain sack stripes are just what it needed to dress it up and make it truly special. Thank you so much Jamie – I love it now that it’s been updated! This is amazing!! 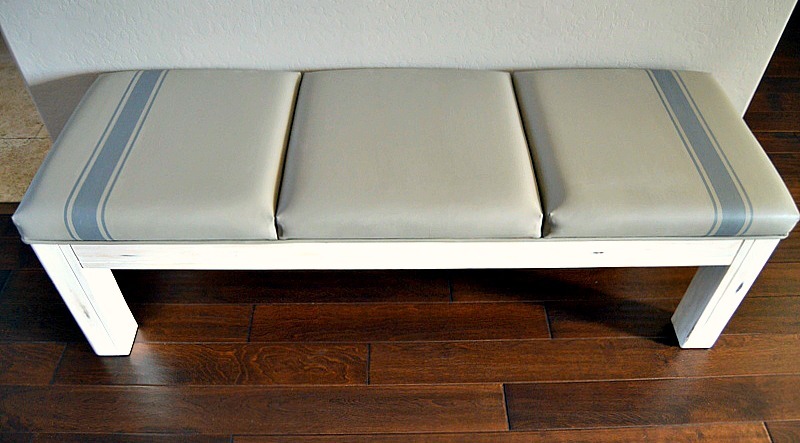 What a great bench and I love anything where I can update without sewing. Thanks so much!! Thank you April! I’m not experienced with upholstery work, so paint was perfect for this project! Amy, it looks great! Good job! Thank you Kendra – it was a lot more work than I had hoped for, but I’m glad I did it! It looks perfect right where it is! I’m totally in love with this, Amy! So gorgeous!! Featuring it at The Creative Corner tonight. Happy Sunday! Thanks so much Amanda! I’ll be stopping back by to link up!